This post was originally published as “API Governance in the Enterprise” on the Levvel Blog. An organization’s API management program will not be successful without governance. Like any IT system, the key to successful governance within API management is people, process, and technology. At the same time, the process can’t be cumbersome and overbearing, or people won’t adhere to it. 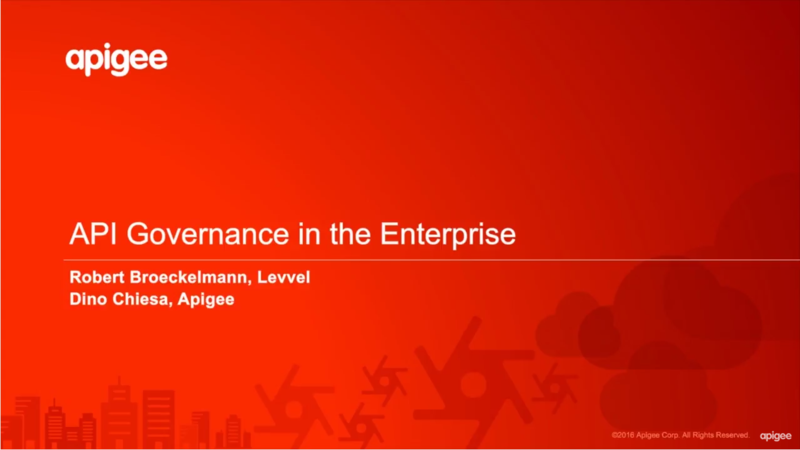 Dino Chiesa of Apigee and I held a webcast on the topic of “API Governance in the Enterprise” on October 13, 2016, during which we discussed how to strike that balance. Watch the video below and/or read the accompanying slides for insights on building a policy-driven approach to API management. Are APIs just an evolution of SOA? API Governance tooling approaches - How do I automate my API program governance?